Critical Race Theory is a movement and series of writings that address issues of racial discrimination, institutional racism, unequal treatment in employment and housing, and more. CRT scholars debate about the law’s ability to resolve social inequality (i.e., via formal equality). While the seeds of the movement are evident in court decisions such as Brown v. Board of Education, 347 U.S. 483 (1954), the scholarship of CRT took root in articles such as “Serving Two Masters: Integration Ideals and Client Interests in School Desegregation Litigation,” authored by Derrick Bell and published by the Yale Law Review in 1976. Bell’s essay and other foundational writings are collected in Critical Race Theory: The Key Writings that Formed the Movement (YLS call # KF4755.A75C7 1995). If you have time to (re)read one CRT essay, consider Kimberlé Crenshaw’s “Mapping the Margins: Intersectionality, Identity Politics, and Violence Against Women of Color.” It is a complex article that resists reduction. In it, professor Crenshaw addresses one of the thorniest challenges of CRT scholarship and praxis: defining the plaintiffs/targets/recipients/intended beneficiaries of antidiscrimination law. “Mapping the Margins” adeptly unpacks the identity issues at the heart of CRT debates, and the problems inherent in identifying individuals via their complex social positions. It exposes the multi-faceted nature of discrimination as concomitantly racialized, gendered, aged, geographical, temporal, etc. Professor Crenshaw’s metaphor of the “intersections” at which we live is a touchstone for thinking about race in the United States and beyond. To explore “intersectionality” in a global context, see Mahmood Mamdani’s When Victims Become Killers: Colonialism, Nativism, and the Genocide in Rwanda (YLS call# DT450.435.M35 2001). It is a kaleidoscopic account of post-colonial racialized violence presented via a case study of modern Rwanda. Professor Mamdani criticizes United States foreign policy in the aftermath of the 1994 genocide, arguing that U.S. policymakers’ binary constructions of good and evil prevented them from serving a productive role in peacebuilding. When Victims Become Killers invites us to consider whether the moral fallacies that contribute to racism domestically also inform our international relations. Brooks, Richard & Rose, Carol. Saving the Neighborhood: Racially Restrictive Covenants, Law, and Social Norms. Copies of this 2013 book are on order. Reisman, W. Michael. The Quest for World Order and Human Dignity in the Twenty-First Century: Constitutive Process and Individual Commitment. Rohrleitner, Marion & Ryan, Sarah (eds.). Dialogues across Diasporas: Women Writers, Scholars, and Activists of Africana and Latina Descent in Conversation. Copies of this 2013 book are on order. Shapiro, Ian & Kymlicka, Will. Ethnicity and Group Rights. Siegel, Reva & Greenhouse, Linda. Before Roe v. Wade: Voices that Shaped the Abortion Debate before the Supreme Court’s Ruling. Ackerman, Bruce. We the People, Vol. 3: The Civil Rights Revolution, Harvard University Press. 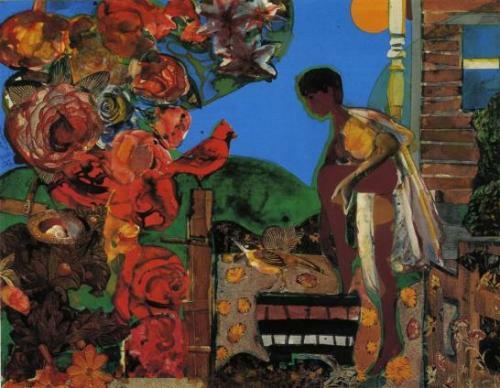 Image: Romare Howard Bearden (1911-1988), Morning of Red Bird. Courtesy of Yale Image Collection.